Berklee lost one of its most venerable faculty members when David Linwood “Lenny” Stallworth passed away on December 20, 2017 at age 58. Lenny was an associate professor in the Ensemble Department who taught private bass lessons and a variety of ensembles during his fourteen-year career at Berklee. Born in Moss Point, Mississippi, Lenny came from a musical family—his uncle was one of the original members of the famed vocal group, Five Blind Boys of Alabama. When he was twelve, he wanted to play drums, but so did his older brother. Lenny resolved the dilemma, diplomatically noting that the family band needed bass to complete the rhythm section. 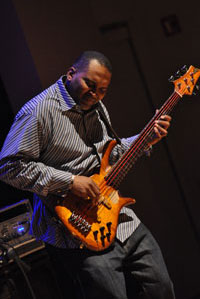 His parents bought him an electric bass and, thus, launched Lenny toward a very successful career, first as a player and, subsequently, as a teacher at Berklee. He studied diligently over the next several years, modeling himself after famed bassists, James Jamerson, Bootsy Collins, Verdine White, and Jaco Pastorius, and began to play with local bands in and around Moss Point and along the Gulf Coast. In 1978, he graduated from Moss Point High School and enrolled in Jackson County College, but left one year later to join the legendary Poonanny band in Birmingham, Alabama. For the next eight years, the band played throughout the South, backing such greats as B.B. King, Johnny Taylor, and many others. It was during this time that Lenny developed his “slappin’ ” style and great understanding of funk, R&B, and blues. Desiring to increase his musical reading and writing skills and gain an understanding of other styles, such as jazz, Lenny and his young family moved to Boston in 1986, so that he could study at Berklee. He remained at Berklee for two years, majoring in performance with a concentration in arranging. Faculty member Donald Brown became Lenny’s mentor and a monumental influence in his development as a musician. He played with Brown in several concerts outside Berklee, which subsequently connected him to play concerts with legendary trumpeters Donald Byrd and Dizzy Gillespie. Lenny remained in Boston for the following few years after leaving Berklee in 1988 and led a funk resurgence in the area. Paul Poindexter, the owner of Wally’s Night Club, convinced Lenny to introduce funk to the club’s patrons, which caught on and resulted in Lenny being in high demand by the top bands in New England. He was known for his extensive repertoire, smooth groove, and the ability to make the electric bass sound like an acoustic bass. Over the next fifteen years, Lenny toured throughout Europe and the U.S. with Kenny Garrett, Roy Hargrove, and Maceo Parker. He also performed with artists Najee, Patti Austin, Ann Nesby, Donell Jones, and many others and recorded with Rohn Lawrence, Teddy Riley, Ray Benzino, Brian McKnight, and Roy Hargrove. Lenny appeared in the Broadway musicals Five Guys Named Moe and Another Saturday Night, and led his own groups, Flipside and Funk Mob. I invite you to share your stories and memories about Lenny in the comments below. Lenny had a gift for bringing to light the individual talents of all his students (which a lot of times was more than just playing one instrument). He did the same for me; I was one of the designated pianists of the ensemble but he heard me sing and encouraged me to continue to develop that gift and all of my gifts as well. He said in auditions, the directors may choose the person who can do both! I appreciate his encouragement of developing my gifts and talents.